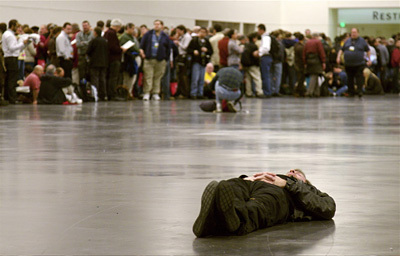 "I took this shot while waiting in line for the keynote address by Steve Jobs at Macworld Expo," said Kevin Miller. "I got in line at 4am for the 9am presentation. Many had arrived earlier than I, in order to get a spot at the keynote. This faithful follower took a break in the middle of the anticipation." Kevin captured this moment with a Canon 30D, 24-105mm f4.0 lens, f4.0, 1/125, ISO=800, Expodisc for custom white balance. If you want to see more pictures from Macworld related events, take a look at this gallery I've posted.